What makes the land special that it qualifies for national monument status? Lucas St. Clair: There’s many, many things. The ecosystem has lots of flora and fauna that only live in this part of Maine. It is a unique part of the national landscape. It is a Northern Hardwood Forest and is not well represented in the National Park System. This landscape influenced the birth of America’s conservation movement through Henry David Thoreau and Theodore Roosevelt. The understanding of plate tectonics from a geologic standpoint was proven on this landscape by a USGS geologist in the 1950s. It has three incredible watersheds – the east branch of the Penobscot River, Seboeis Stream and the Wassataquoik Stream. And incredible views of Mount Katahdin. It acts as a climate refuge and it is also a very important piece of landscape for the Wabanaki people. What are the main reasons you want to create a national monument? St. Clair: To protect a resource that offers all of the things I just described and beyond that, to bring economic benefits to the Katahdin region, a region that needs economic revitalization and a diversified economy. National parks have been proven to do that all across the country. Are we at a crucial time in the process with President Obama leaving office at the end of the year? St. Clair: It’s the centennial of the National Park Service and these communities are not getting any better. From an economic standpoint, we are at a very crucial time. We are at a crucial time to revitalize the economy of the Katahdin region. Would you like Obama to sign an executive order for the monument by time he leaves office? St. Clair: Yes. I think that is a great interim step to create a national park and national recreation area. What happens if Obama does not act? Is it back to square one trying to educate a new administration? St. Clair: Our conservation objectives have been achieved, which is the mission of our foundation. We would continue to work on conservation in Maine and in other places that would be of interest to our board of directors. What is your prediction? Do you believe that Obama will create this national monument? St. Clair: I certainly can’t speak for the president but based on the local support and the enthusiasm that this project has in the region and across Maine and the overwhelming response in favor of the monument when [National Park Service] director Jarvis listened to the people of the state of Maine in Orono [on May 16], at least advisors to the president, are taking note of the great support. What is your reaction to being invited to speak at a hearing of the U.S. Committee on Natural Resources on Wednesday? Originally, only opponents were scheduled to speak. St. Clair: I never got a direct invite but saw that they listed me as a witness on Friday afternoon. It looks like they added my name after the headlines came out, accusing them of having a lopsided hearing. I am not going to go. How do you respond to criticism that traditional uses – hunting, snowmobiling, fishing, could be ended or limited with a national monument? St. Clair: It is absolutely not true. In fact, it would be enhanced and guaranteed forever. St. Clair: That’s the reality. We are getting what is now private land and we are donating it to the American people. Through that process, we are ensuring that hunting and fishing and snowmobiling will be allowed on the property. What is your take on the reasons residents in local towns – East Millinocket, Medway and Patten – did vote against the park? St. Clair: It was a small percentage of the voters. The opposition to the park is very passionate. It is very emotionally charged. They put a lot of time and effort into making their side heard and they showed up to vote. When you look at the Board of Selectmen in East Millinocket, in Medway, in Patten – elected officials are in support. The Houlton Chamber of Commerce, the Bangor City Council and over 200 businesses – there is support from people who have taken time to look at it. There is still so much misinformation. It is hard for people to understand exactly what this is. I feel like some people think that if it was not a national park or national monument, it would go back into timber production. That is not going to happen, but some people think it might. There are issues around air quality. People think that air quality standards will be changed. That is absolutely not true. In fact, it reads the opposite in the Clean Air Act. People think that traditional access like hunting and snowmobiling goes away. That again, not true, but people say it all the time. People stood up in Orono and said it. I can only do so much to make our points heard. There are some people that refuse to hear it as truths. Do you need some kind of consensus to create the monument? It just seems that Maine is sharply divided on the issue with several local towns – Patten, East Millinocket and Medway voting against it, for example? St. Clair: When I think of division, I think of half and half. Certainly, there is much more than half of the people in the region that support this. In the last poll we did (last year), it showed 67% of the 2nd [Congressional] district supporting the national park and many of them conservative voters. [Of 500 respondents, 25% opposed. The survey was completed by the same pollster who has worked for U.S. Sen. Susan Collins, R-Maine]. There is much more support for this than there is opposition. I don’t think that any big project will ever come to consensus. That’s why we have to just get the majority. That is what we have at this point. How do you view the appearances by National Park Service Director Jonathan Jarvis [in Orono and East Millinocket on May 16] to discuss the monument? Is that a sign that the Obama administration is serious about it? St. Clair: Yes, absolutely. The Obama administration is committed to transparency in this process. They have public meetings. This public meeting (in Orono) was to gauge whether or not there was local support. Over 1,000 supporters showed up and overwhelmed people that were not supportive. It was a very fair and civil conversation. Both sides were able to speak and be represented. Will the land held by Elliotsville Plantation always be open space even if the monument is never created? Is there a possibility the land could ever be developed or sold for home sites? St. Clair: No. It is not the mission of our foundation. The mission of our foundation is conservation. St. Clair: Because we want to have economic benefit and economic benefit comes from national parks and not from conservation land. We can look across the state. There has been almost 3 million acres of land put into conservation in the state and all across the interior and we haven’t seen any economic benefits other than timber practice. People visit, people travel around the world to visit our national parks. Having one in the Katahdin region will bring that economic revitalization. How many acres of the land on Elliotsville Plantation is currently open for public access? St. Clair: All of it. How much of it is open for snowmobiling and hunting? St. Clair: We have about 30,000 acres that are open for hunting, 33 miles of snowmobile trails. Why did you decide to do that? St. Clair: It is what people in the Katahdin region want – access for hunting and snowmobiling is part of the way of life in the Katahdin region. We want to make sure that way of life is recognized and continued to be allowed. If the land is created as national monument, will that current 30,000 acres remain as it is for hunting and will the snowmobiling remain? St. Clair: Yes. It will. That will be part of the deal as far as you concerned? St. Clair: That’s right – exactly. 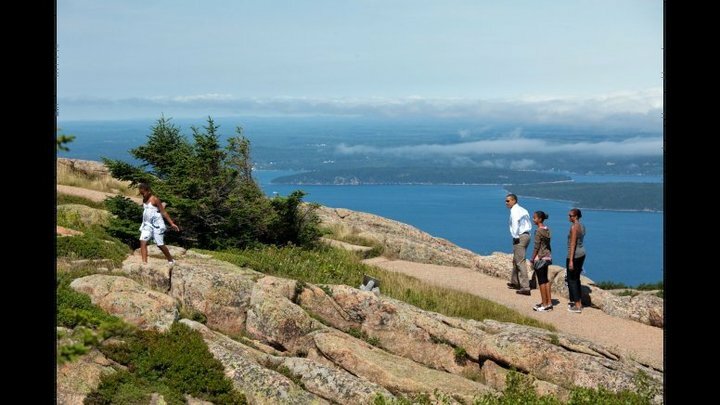 Is your proposal for a national monument inspired by Acadia National Park? St. Clair: Absolutely. It was inspired by the leadership President Woodrow Wilson had to create Acadia. It was a huge inspiration to me and my family as well as the other national monuments that were created around the country that led to national parks including Grand Canyon and Zion and the Olympic Peninsula. These are America’s crown jewels. They were created at one time initially as national monuments. That is certainly the source of our inspiration. Your vision would be first a national monument and then create a national park out of the land eventually with congressional approval? St. Clair: Exactly, that is our goal. As I understand it, your mother, Roxanne Quimby, will donate land to Acadia National Park? The Bangor Daily News reports that Elliotsville owns more than 100 acres on Mount Desert Island, including five separate tracts of land totaling more than 60 acres in Mount Desert and Southwest Harbor that are expected to be donated to the park. St. Clair: Yes. We have several land holdings that our foundation owns that we will be donating to the park. There is a handful of different parcels that are spread around the park. None of them are very large. All are within the park boundary. St. Clair: Over the course of this summer and into the fall. That’s our plan. Thank you, Lucas St. Clair. Dolores Kong and Dan Ring are co-authors of the Falcon guides Hiking Acadia National Park and Best Easy Day Hikes Acadia National Park, and also blog at acadiaonmymind.com. They’ve backpacked the 270-plus miles of the Appalachian Trail in Maine, and are members of the Northeast 111 Club, having hiked all major peaks of the Northeast. Dolores, a former staff reporter at The Boston Globe, is a CERTIFIED FINANCIAL PLANNER™ Professional and senior vice president with Winslow, Evans & Crocker, Inc. (member of FINRA/SIPC) in Boston. Dan, a journalist and former Statehouse bureau chief in Boston for the old Ottaway News Service and for The Republican, the daily newspaper for Springfield, Mass, is also an operations professional with Winslow, Evans & Crocker, Inc. (member of FINRA/SIPC), in Boston. They are married and live outside Boston. Click on links below to go to our Acadia hiking books on Amazon.com, one of our affiliated partners. Price the same whether you buy via affiliated partner links from this blog, or directly via partner’s Web site. Among our other affiliated partners: ReallyColor LLC, REI, TripAdvisor(R), eParks(R) and Gift MDI, an online source for Acadia-area gift certificates. Small affiliate partner fee helps cover cost of blog. Thank you. Acadia on My Mind is a member of the BDN Maine Blog network.